Deep among the amazonian rain forest dwells an exotic dark haired woman who is at one with the wildlife. 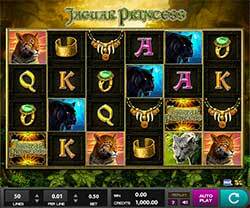 In fact this woman is the Jaguar Princess and this slot you'll get to see her and her friends in their natural habitat! This beautiful game from IGT and High 5 Games sits on a 6 reel, 4 row slot grid with and offers many of the features that made IGT one of the most beloved slot developers on the planet. Deep among the amazonian rain forest dwells an exotic dark haired woman who is at one with the wildlife. In fact this woman is the Jaguar Princess and in this slot you’ll get to see her and her friends in their natural habitat! This beautiful game from IGT and High 5 Games sits on a 6 reel, 4 row slot grid with and offers many of the features that made IGT one of the most beloved slot developers on the planet. Of course in the background behind the reels you see the dark intimidating jungle while the Jaguar Princess lies front and center as a symbol on the reels. Other paying symbols in the game include a panther, leopard, jaguar, a ring, a bracelet, a necklace, Claw mark scatters, the game logo and card symbols queen through ace. The slot layout is different from most video slots in that it offers so many more options for wins with 6-reels instead of the normal 5-reels, and 4-rows instead of the normal 3-rows. What that amounts to is 9 additional symbols on the reels! Super Stacks Feature – With Super Stacks the reels contain stacks of symbols that transform into one of any of the symbols on the reels at the start of each game. If you can get the claw mark scatters as a Super Stack, you’ll increase your chances of getting max free spins! Claw Mark Scatters – Because the game features stacked symbols, in order to earn free games you have to get a few more symbols than is typical. Not to worry though because they happen more often than you might thing. Land 12, 13, 14, 15 or 16 Scatter symbols and you will win the same number of free spins as the number of symbols hit. So if you hit 16 Scatter symbols, you’ll win 16 Free Spins!